With version 2.0 we have spent some precious development time into a new package manager. Similar to other solutions it allows to separate components into packages that can be independently installed in the IDE. Although there is no imminent need for it right now, it opens the IDE for 3rd party and user components that can be integrated into the RAD environment easily. While there is still some work ahead to iron out some teething problems in the upcoming beta version, it is already used in combination with the new visual designer and its basic set of components, called the “Smart Component Library” (SCL). In addition to the basic set of components, two additional 3rd party packages are shipped with the product TeeChart.spk (by Steema Software) and Grid.spk (by Berg Software). The packages are built to integrate neat-less into the IDE’s component palette. Furthermore we added an example package called W3Slider.spk with embedded source code. It is designed according to the all-in-one-file approach, that can also be used for the project. With packages designed like this, installation can be as easy as dropping the spk file to the ‘Packages’ folder. In the future we will also add support for encrypted package source code, so that it is possible to build closed source packages. While the amount of changes (compared to Version 1.x) in this regards seem to be very little, it meant infact to rewrite the entire chain of handling components (in the component palette, visual designer & property inspector) from scratch. Previously all components were “hard coded” in Delphi, which means for every new component we added, we needed to update the component palette, add a dedicated Delphi component for the visual designer & property inspector, convert from Delphi to DWS at compile time and handle property storage in form file. All this code was convoluted in several manners and one couldn’t change one part without affecting other parts in the IDE. But let’s stick on what we have now, let’s stay on topic! The packages are basically in a similar XML format as your projects, which means you can – in case of emergencies – edit (and eventually fix) the packages at any time. This can be quite useful, since at the moment the GUI part of the package manager is limited to the essentials. For example it’s not possible at the moment to specify different categories for different components in one package. So far you may only specify one category per package, while the packages would allow an even more detailed specification of categories (per component). Also it’s not yet possible to change/specify icons for a component other than by editing the package files. But of course you don’t need to know all the details if you only want to work with the packages, so let’s move on to the next chapter. The installation of packages is very easy. All you need to do is to drop the package to the ‘Packages’ subdirectory. Note that it might also be necessary to add glyphs for the component palette to the glyphs directory, but that depends whether the icons are specified internally or externally. At the moment a basic set of (external) glyphs is shipped with the product. We decided to make them available externally, so you can change them anytime to your favorite set of icons (the current icons are not always as clear as possible). Once you have added/removed a package to the package subdirectory you have to restart the IDE in order to get the packages enumerated and listed in the component palette. If you have deleted a package, it will remain in the IDE’s cache until you restart the IDE. After the packages have been installed, you can use the components in the same manner as you used the components in version 1.x. Believe it or not but this time Smart Mobile Studio actually got something Delphi doesn’t (Delphi 7 was our initial model): global renaming. When you rename a unit under Smart, it doesn’t just alter the source-code for the unit in question – it alters all references to that unit in the entire project. No need to backtrack and update the uses declaration elsewhere, they are all changed in a single sweep. We can actually map the use of a class or method throughout a whole project, and it’s super quick as well! But we have more tricks up our sleeve. I took the time to make a recursive database indexer for our RTL files. So the first time you run Smart it will parse and extract every inch of information about the RTL and store it in a database table. This table is kept in memory and used to speedup extraction of data regarding classes, methods and properties. I doubt we will be able to stuff all the goodies into version 1 of Smart Mobile Studio, but rest assured that I will do my best to get as much features into Smart as I can. 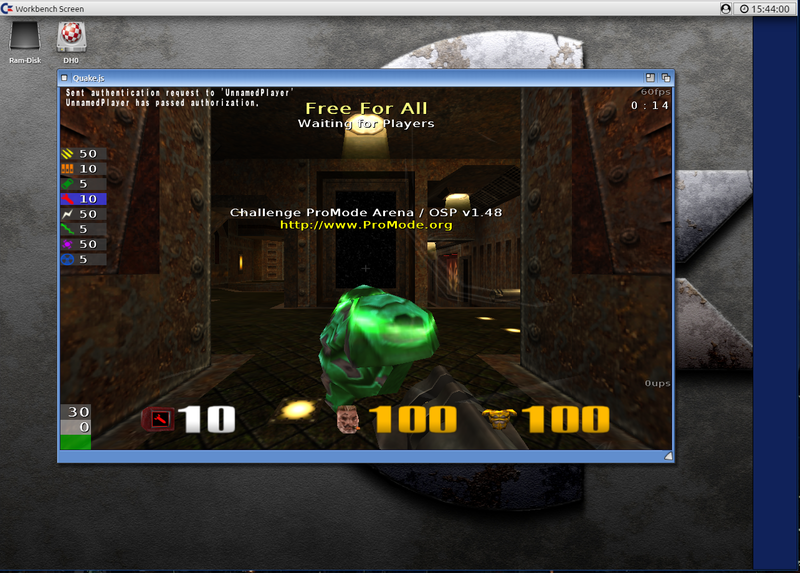 And now that the indexing and background compile is up to speed, the time has come to finish the globals feature. 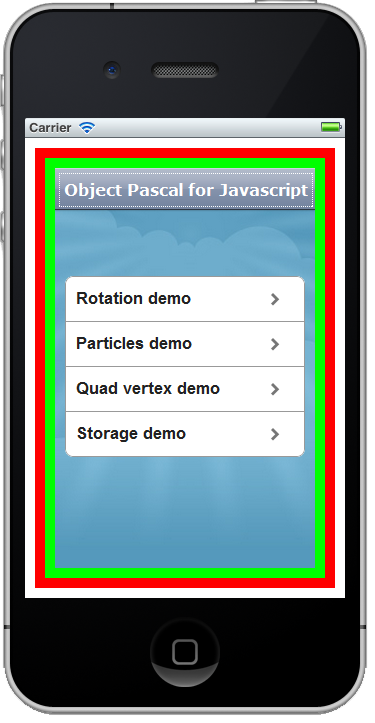 Globals allows you to edit a list of object (of any class) that should be created automatically by TApplication. Very handy if you have a database connection or some game logic you want to be created on startup. 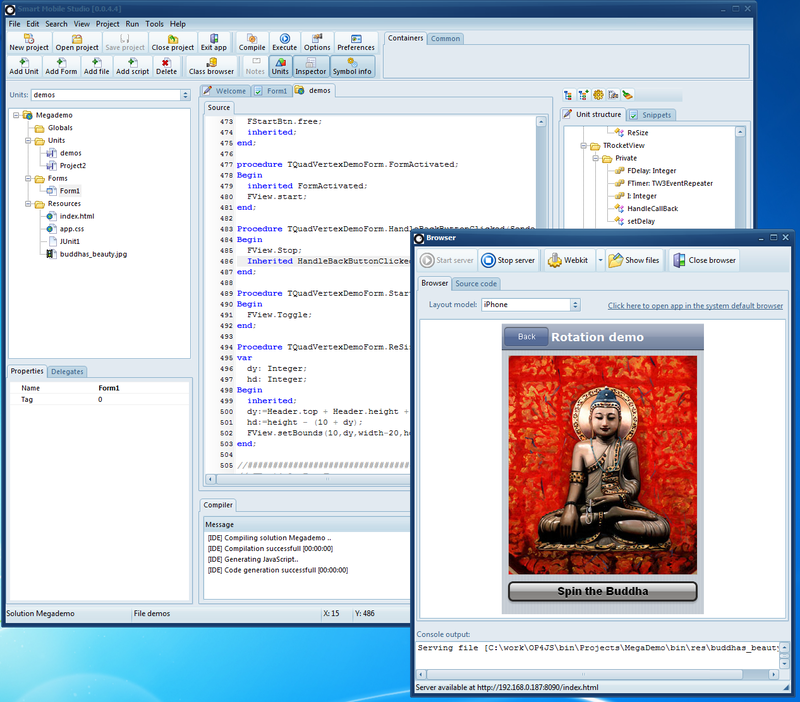 As we approach the final alpha release of Smart Mobile Studio and entering the beta stage, the IDE is really starting to feel more and more like Delphi. It truly is the attention to little things that makes an IDE work in real life – and Smart Mobile Studio is no different. So what can you expect to find in the upcoming versions? 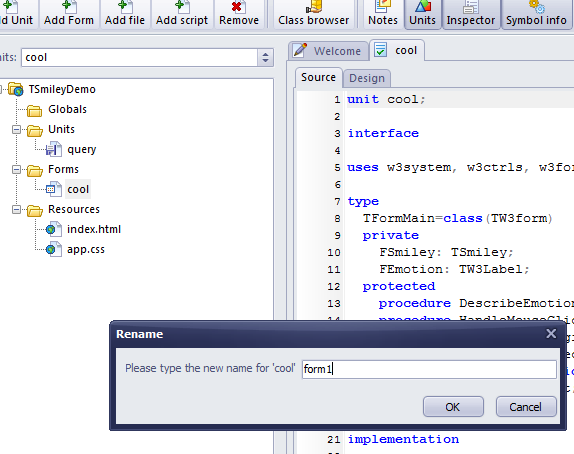 Basic IDE functionality includes the ability for the environment to alter your source-code. To poll this off the IDE must know things like where does the “unit” keyword appear in a source-file? It must also tell the difference between the interface and implementation section of a unit and other important things like where in your code a class is defined. We are happy to say that this functionality is now under wraps. So when you rename a unit from the project tree view, the source-code is altered accordingly. But of-course this type of functionality has a lot more going for it – because it forms the foundation on which the layout designer rests. The designer must by its nature have access to the source-code and it must also be able to add, alter and remove sections of a unit. And we are going to alter the “form designer” formula slightly, with less mess and less data in the final compiled application. You will just have to wait and see how cool it is. The browser window has also seen a radical change. We used to limit the view to iPhone only but have now removed the iPhone background and opted for several sizes. So now you can check how your app will look on your iPad, your webkit browser (any size) and various other standard measurements. In version 1 there will be no support for individual source packages, but we have designed a system that will make it very simple to get your own components into the design-cycle. The IDE will have a normal ini file where you can register components. To install a new component or a series of components, just add a new section to the ini-file, register each component (syntax pending) and copy the unit(s) to the library folder. Then go to the Tools menu and click “Rebuild RTL index”. The previous class browser parsed and scanned each unit on startup which caused a noticeable delay. The new class browser will extract it’s information from the RTL index which is basically a database table covering ever aspect of the registered RTL units and libraries. The final outcome will be super-quick and allow for click-able links. So if you click on an ancestor class, it will instantly browse to that class. Very handy and more natural. You can also go directly to the RTL source-code and check out the implementation. While not in the original specs I decided we must have FTP publishing support in Smart Mobile Studio. In popular demand from people in the alpha group I also added zip support. This means that you can now export your project either locally or remotely, in either normal file format (backup) or as a compiled project. This adds to the already built-in functionality to save your entire project as a single file (all external files can be included in the project file). 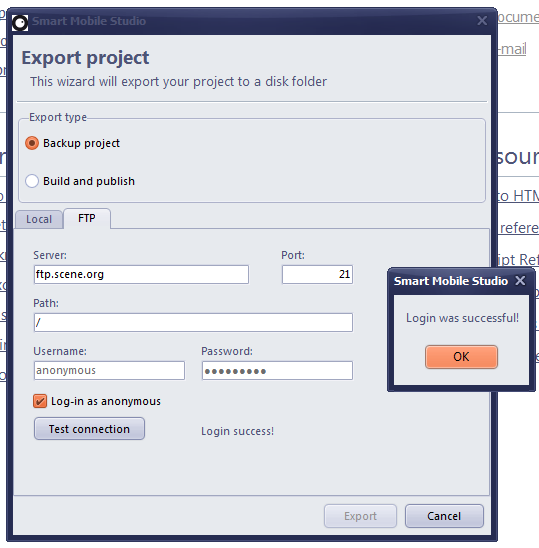 If you go for the “backup” export then Smart takes you entire project folder, source and resources, and copies it to the target. If you opt for a zip export then all the files are stored into a normal zip archive (native Delphi zip support of-course, no external libraries needed) and saved to the target location. If you have selected FTP as your mode of export then the zip archive will be shipped off that way. This will make it a lot easier to maintain X number of mobile applications from your developer machine no matter where you host the files. Yes, I know. This month was meant to be a very active time for OP4JS but sadly Norwegian weather brings with it complications like colds and the flu. 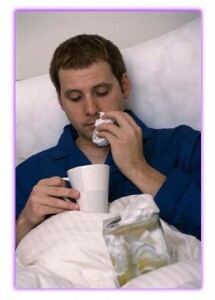 So in short i have spent nearly 3 weeks off the grid with nothing but fevers, allergies and sneezing. So to those of you eagerly awaiting the Alpha release of OP4JS I am sad to inform you that we might have to push the date forward to make up for lost time. Be that as it may my health is finally picking up after the onslaught of germs, viruses and weather up here – so for the past week I have been eagerly working on the object model, in this case: TApplication. Much like under Objective C (which is the official language you use to create iOS applications, although you can now use alternatives) TApplication is the root controller object. It is in charge of creating a visible screen, kick-starting your application code, which in turn creates forms and register them, which is ultimately injected into the viewport. The viewport (or visible area) being a child object of TScreen – the place where forms do their thing. TApplication have to be dynamic enough to suit all 3 variations – and we also want to safeguard ourselves for the future where more project types come into play (libraries being on top of the list). It also have to manage the forms you add to your application correctly, which means taking care of transitions, pre-positioning forms prior to movement and many more details. But thankfully we found a solution that is simple, elegant and robust. And no external dependency either. We might even drop jQuery soon because quite frankly: we dont need it. On your right is view of how we organize things. The white color is from the actual HTML5 document, the red color is TScreen – which in turn has a child TCustomControl called viewport (green). The benefits of this layout is that you can (if you want to) add a global header directly to the TScreen object. So instead of each form descending from TW3HeaderForm (which as the TW3Header control built into it) you can just create one header for the whole app. Of-course this means that your forms have to change the title and deal with the back and next buttons directly – but that’s just as easy as it would be in ordinary Delphi. The second benefit is more or less the same, except for the footer. Many native apps have main view controller that introduces a fixed header and footer, typically containing a tab-bar at the bottom and a toolbar on top. We want to support this because it solves a lot of problems (and also makes you apps faster. The less objects the faster it runs, that’s how it works in Delphi as well). Well — I better get back to work!